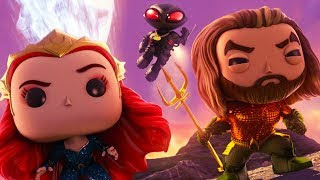 If Aquaman is half as adorable as Funko's latest animated short...well, that would be the most serious departure from the Zack Snyder era possible. The latest is titled Aquaman: Final Showdown, and it's the last of a four-part series featuring Funko Pop versions of Jason Momoa's Aquaman and Amber Heard's Mera. In this episode they engage in a cutesy climactic battle against Orm and his soldiers. This after Mera is apparently stunned by Aquaman's classic gold costume. Or maybe she's admiring Momoa's Funko pecs or something. I've included each chapter below so you can see this deep, complex story in full.